Its 11am and almost high tide at the settlement of Muanivatu. The tide water from the nearby river enters the settlement and submerges the drains and some household grounds. With the tide comes rubbish, debris and an overpowering stench. The residents are accustomed to this as they have been living in this informal settlement for years now which is sandwiched between the main road and a mangrove swamp followed by the river, but conditions can surely improve says a settlement elder. 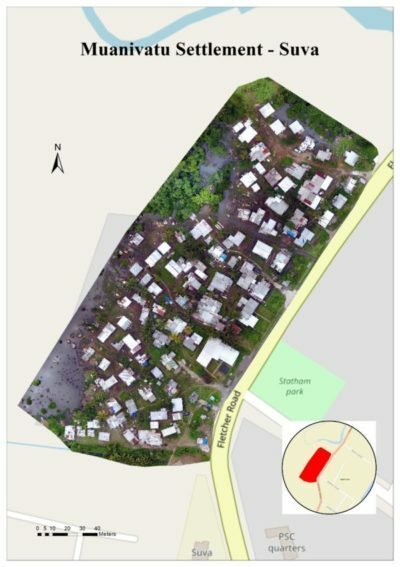 The settlement of Muanivatu consists of approximately 54 households with two small food marts and a newly renovated kindergarten. It is located a 10 minute bus ride from the main city of Suva. Despite being so close to one of Fiji’s major urban centers, the atmosphere at the settlement is quite different. Since the settlement is situated right next to the river, during high and king tide parts of the settlement gets flooded. Housing conditions are fairly poor and the soil is too boggy for many types of vegetation. The residents have also hoarded tires and used it during cyclone season to secure their roofs. 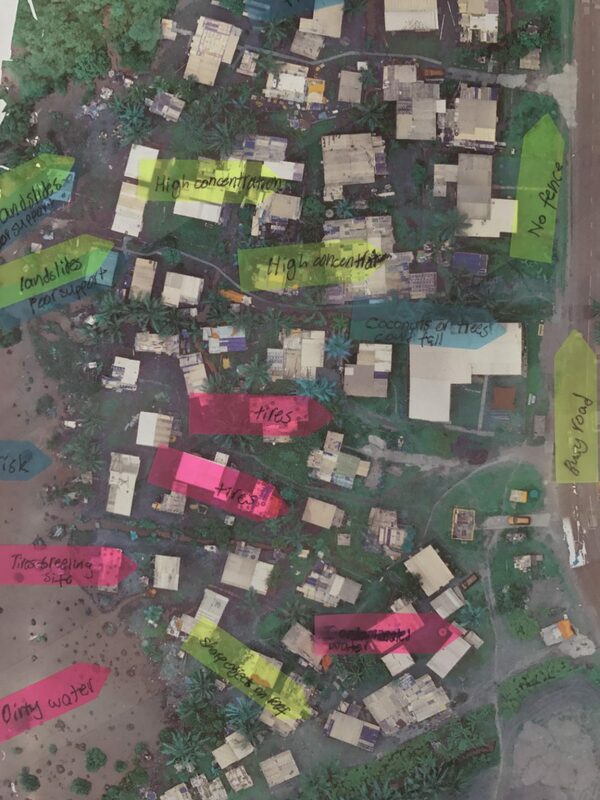 Pacific Flying Lab together with the University of the South Pacific Geospatial Science division has embarked on a journey of community mapping and engagement to collect baseline data and raise awareness on the possibilities of using drone technologies for humanitarian work. Along with Muanivatu, villages like Naviyago and Naboutini have also been mapped to understand the basics of community mapping, engagement and future planning to mitigate the effects of climate change on livelihood and food security. These projects are primarily conducted by youths and university undergraduates with team leaders in place. Muanivatu settlement elder, Mr. T[…] was kind enough to let us map the area with our Phantom 4 drone. A team of three were deployed to collect the ground control points and images so that it could be later processed in Pix4D. Maps resulting from this project were used in the first ever Pacific Flying Labs March training in which students from various high schools around Suva participated. The student participants were prepped on how to plan flight plans, conduct safety checks and how to analyze map to extract useful information. The students were given scenarios where they had to analyze the map from the perspective of an environmental analyst and pick out areas of safety concerns, health risks and natural hazards in the maps together with tactical solutions on how best to tackle these situations. 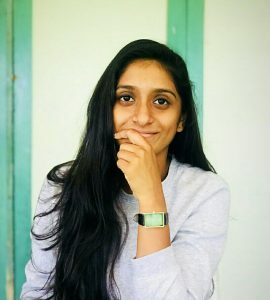 Amrita Lal is the Coordinator of Pacific Flying Labs based at the University of the South Pacific (USP) campus in Suva. She is the first drone pilot to have deployed with the Fiji Red Cross and is well-versed in the processing and analysis of aerial imagery. Amrita has also deployed different types of underwater drones and given hands-on trainings to local youth on both aerial and underwater drones. She recently gave a talk on Pacific Flying Labs at the annual international GIS conference in Fiji and will be a speaker at the upcoming World of Drones Congress in Australia. Amrita also serves as a Research Assistant in Geospatial Sciences and previously mentored undergraduates in the Geospatial Science Department at USP. She has a BA in Science with majors in Geospatial Science and Geography from USP and previously interned at United Nations Women.